As any experienced acrylic pour artist will tell you, this technique isn’t as simple as just mixing some paints and pouring them out! Striking, dynamic pieces are the result of careful technique and a precise balance of ingredients. In this guide, we’ll focus on the different additives you might combine to create an acrylic “recipe” for use during a pour. Read on to learn all about additives, from why we use these products to the specific ones we recommend for budding artists! Technically speaking, additives are anything you add to your paints. They could be a simple substance, such as water, or a product made from a few different compounds, such as Floetrol. Additives are intended to change the appearance, character, and/or behavior of the paints you use. There are any number of reasons why you want to use at least some additives when you work with acrylic pouring. Many additives, especially pouring mediums, are intended to make paints more suitable for use in acrylic pouring. By adding a pouring medium, you give yourself the fluid dynamics of thinned paint without sacrificing the integrity of the binders or pigments. Additives give you more control over paint consistency to make it more predictable to work with and easier to manipulate. Some additives also help to preserve your finished piece. They’ll prevent cracking or crazing, and/or help to improve the longevity of archival pieces and commissions. Most pouring mediums (Floetrol, Liquitex, etc.) will accomplish this, but you can also use a specific preservative in addition to your medium. Finally, there are a range of additives that change visual aspects of your paints, both while they’re wet and when they dry. You can use additives to increase the number of cells in your piece, to give your paints a glossy finish, or to add metallic effects. That’s just scratching the surface of what you can do visually with additives, so we always encourage new artists to explore and experiment to their heart’s content! Rubbing alcohol is something you’ll see mentioned fairly often in online tutorials and videos, but it’s not actually common among the experienced/professional acrylic pouring community. Although some folks swear by it for creating cells, our results haven’t been encouraging, so we don’t endorse using alcohol. There are simply better, more reliable ways to go about getting dynamic cells. Pouring mediums are additives which are used to generally improve paints and make them easier to work with. Pouring mediums are designed to give your paints the fluid dynamics of thinned paint, without you having to add any water. Since water weakens both pigments and binders, that’s a big advantage! A good pouring medium will improve flow and consistency while maintaining vibrant color and strong binders. Floetrol: your best friend, as far as your pocketbook is concerned! Floetrol is available cheaply, and it’s easy to buy in quantity. Any good hardware store carries it, and you can always find it cheaply online. Floetrol isn’t an “art”-specific product like Liquitex, but it accomplishes the same things. The upside is that you don’t pay a premium just to get the art market version! While some pros will tell you Liquitex gives you a slight edge (and we’d agree), the differences are negligible. You can learn more and find a recipe for using Floetrol here! Liquitex: Most professional and expert pour artists will tell you that Liquitex is the best pouring medium on the market. We’re inclined to agree, though only the most perfectionist types will be able to tell much of a difference between Liquitex and Floetrol. We’d encourage most people to start with Floetrol. Once you’re more experienced, dabble with Liquitex and see if it makes a perceptible difference to you. If so, it might be worth the extra investment. Liquitex Gloss: Liquitex also makes a glossy pouring medium that you can use to improve fluid dynamics and get a shiny finish all at the same time. It’s not wildly different from using Liquitex alongside a separate gloss additive, but it’s far more convenient and the consistency ends up being better. If you’re chasing the shine, this should be up your alley! Rainx for cells: Last but not least, Rainx is a helpful pouring medium for creating cells. Most of us use silicone oil alongside a pouring medium to get cells to form, but this is a more convenient approach if you want to avoid using droplets of silicone. You don’t have to wipe off any residue, either. Check out our guide to pouring mediums if you want to learn more about all these products! As we mentioned above, some additives are intended to give your paintings better longevity. Longevity isn’t something that you need to worry too much about when you’re starting out or just doing some experiments, but more experienced painters like to approach each piece with the idea that they’ll be able to keep it or sell it, depending on how it turns out. After all, you never know when an experiment will go perfectly right! You don’t want to put in all that work only to have things flake, fade, or crack when your painting dries and goes on the wall. Most of us are content to just use Floetrol or Liquitex as a preservative. Both pouring mediums do a good job keeping things together and looking vibrant over the long haul. However, some folks like to go a step further and use a specific preservative product. If that’s something you’re particularly concerned about, you can also use Lineco 901 bookbinder’s glue. It’s neutral in PH and plays nicely with other additives. Oils and lubricants are used in acrylic pouring to create cells. These visual effects are one of an acrylic pour artist’s best tools in making compelling pieces, so many folks tend to use oil additives in every pour. The oil product helps to create cells by remaining separate from the paints. Oils don’t mix well with acrylics, so they separate into layers and slide around, which is why we end up seeing cells and craters on the surface of the piece. Silicone is the most popular type of oil for making cells. It’s generally considered to provide the most dynamic cells, aside from the more expensive but similar dimethicone. Silicone is light, neutral, and creates perfect cells. It’s also inexpensive and predictable. There are virtually no downsides, unless you have a sensitivity. The first option is to use a spray lubricant which includes a substantial amount of silicone. You can find products such as WD-40 relatively cheaply, and most folks have them around the house or garage already. Be sure to check any can you find at home before you use it! Only certain lubricants contain silicone. Many are silicone-free and won’t do much to help you out. Using a silicone lubricant is a good place to start experimenting with cells. However, there are some substantial downsides that keep spray lubricants from being suitable for any pieces you want to keep or sell. They typically have a yellowing effect on paints, contain harmful chemicals, and are very messy to use. They degrade significantly over time. Feel free to experiment with these, but don’t use them on anything you’re planning to keep for a long time. Pure, 100 percent silicone oil (the type used for treadmills and sewing machines) is the other way to go. Using pure silicone is by far the best way to work, since there aren’t any extra ingredients and additives that might mess up your paints (or your lungs). This stuff is usually sold in bottles with droppers, so it’s also very neat, compared to the messiness of spray cans. Find our guide to different types of silicone here! This is a skin-safe alternative to silicone which is used in many beauty products. Another common usage is personal lubricants. Of course, as with silicone, the best approach is to buy the pure stuff without any additives. Dimethicone is super easy to work with, since you won’t be bothered if any gets on your fingers. It produces the same effects as silicone oil. In fact, some painters say it gives them bigger cells! However, it’s more expensive than silicone and it’s also harder to find in its pure form, since most beauty products mix it with other ingredients. If you have a sensitivity to silicone or simply want a skin-safe product to work with, use dimethicone! It does a great job at creating large cells. Natural oils such as those used for cooking can see appealing when you start to experiment with adding oils to create cells. However, as we explain in our guide to the best types of silicone (link above! ), they’re not a good choice. They usually discolor somewhat, and any organic material you use to paint is eventually going to go rancid. When that happens, you’ve got a moldy, smelly canvas on your hands. Natural oils might be a place to start your experiments, but they’re not suitable for use in pieces you’re going to keep long-term or sell. In the visual modifier category, you’ll find things like glitter, gloss, and other elements to add interest and extra pizazz to your pieces. Most of us will end up buying paints that already contain these additives, but you can also buy them separately. The downside is that you’ll have to mix and distribute them yourself. However, if you’re going for something more specific that doesn’t want even distribution, this can be an advantage! There are countless products available, so have a look around and see the possibilities. Now that you’ve read this guide, you should be much more knowledgeable about acrylic pouring additives! We hope we’ve answered all your questions and then some. If there’s something we’ve missed, let us know! Leave a comment and we’ll do our best to help you out. For more resources, tutorials, and recommendations, head over to our homepage. You can also find all our recommended supplies for beginners in our guide here. Hi Sandra, I am also in Aussie, I’m also new to pouring and would be interested to know what oils & mediums you use? Has anyone tried 3 in 1 Silicone. I’ve not used that exact one but its probably similar to the ones in the cans. 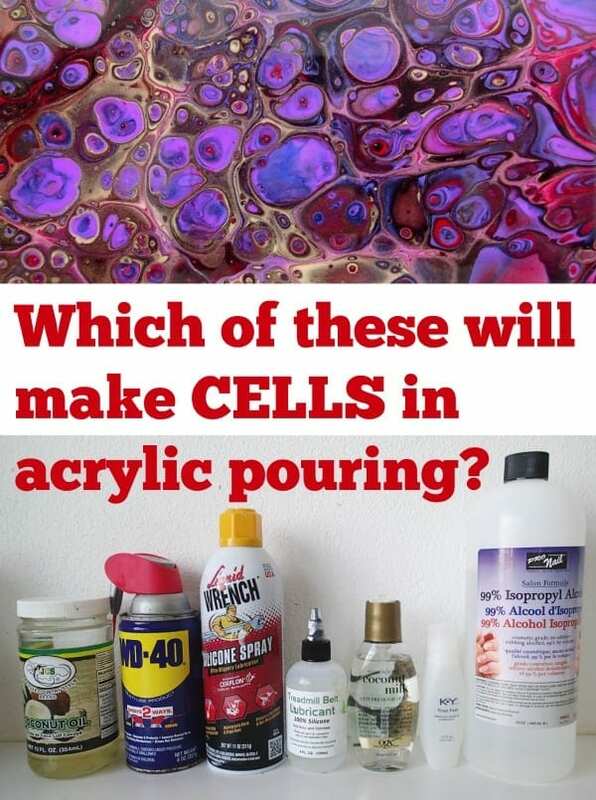 You can get cells, but I’d prefer to use a ‘cleaner’ oil where possible such as the treadmill silicone with is 100% silicone and doesn’t have all the other additives you find in the cans. Thank you for the information on oils. I’m just starting out and first used the WD40 silicon spray (for convenience). I got very limited reaction and was disappointed, so much so that I felt like giving up. Then I found the Treadmill oil at a large sports shop , Decathlon, in town and bought two bottles so I’m ready to try that now. I love your metallics on black background! I hope FB is kind to you, I wish there was a way we could let them know how valuable your assistance is! Regards Jan ?? Is treadmill silicone that’s 100% silicone safe for your skin or not.i mean if you get it on your skin will it hurt you. What is the ratio of silicone to paint? Hi! I have a question. I have been using an oil based additive. But, when I use it, there are small little spots on my canvas, where I put my paint mixture that sort of “move” away the paint and the canvas shows. It almost looks like its separated. Sometimes this happens on the flat part of the canvas itself, while other times it happens just on the edge of the canvas. Am I using too much? Should I only put it in certain colors? I have tried everything under the sun to keep it from doing this and it still does it. And I am sort of stuck on my decision to use the recipe I am using because it gives me awesome cells so I don’t want to just stop using it. There are a couple of reasons why this might be happening. My guess is it might be that the canvas is not stretched taut, which causes sections of the canvas to “sag.” It’s often not visible to the naked eye, and you might not think of this since you’re using a flat surface. Try finding something to fit underneath it to make it sit flush with the wooden frame. I’ve been using treadmill silicone for a few months now and have not had any reaction. It pours out of the bottle in tiny drops so I guess the only time I’ve got it on my fingers is when I clean a painting. It’s sold as lubricant for sports treadmills so I suppose it must be safe. I mean a reaction on my skin, not the canvas! When you finish a piece should you put something on it like a sealer (not sure if that is the correct word). Choosing a protective finish to seal your paintings depends on the effect you’re aiming for, Susan. Common ones used for acrylic pouring paintings are resin, Krylon varnish and acrylic coating, and Polycrylic finish.